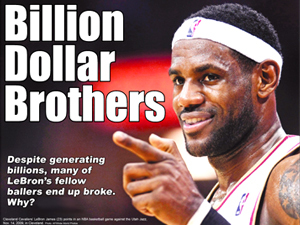 Despite generating billions, many of LeBron's fellow ballers end up broke. Why? (FinalCall.com) - From executive boardrooms to school yard basketball courts, sporting fans across the country are closely watching to see which city will win the LeBron James sweepstakes. The NBA free agent is being courted by multiple teams looking to not only boost their chances of winning a championship but take advantage of the multi-million dollar brand attached to Mr. James' name to drive their local economy. As one of the highest paid athlete endorsers in the world, Mr. James opted to test his options after seven seasons with the Cleveland Cavaliers. During that tenure he surprisingly terminated his first agent Aaron Goodmin, who was able to negotiate nearly $140 million in endorsement deals for the 25-year-old. Now Mr. James' former high school teammate Maverick Carter and two other friends sit at the helm of management and the stakes are high as teams present their best deals to capture the NBA's reigning MVP. According to a report on Forbes.com, Mr. James met with executives from the New York Knicks on July 1 as they presented a commissioned study from a marketing consultantthat predicts that Mr. James could earn at least $1 billion in salary and endorsements if he chooses to make Madison Square Garden his home for at least 13 years. That figure exceeds what he would reportedly earn if he stayed in Cleveland or played in either Chicago or Miami. But that study is not stopping people like New Jersey Nets part owner Jay-Z from working to sway the high dollar player. Only $4 million separates the Knicks and the Nets in the amount of money they have to spend under the NBA's salary cap, with $34 million and $30 million, respectively. “Winning championships is the most important driver of brand value. However, if LeBron James seeks to maximize his personal brand value, he must not only consider where he can win the most championships, but also which franchise brand and market will return the greatest value for those achievements,” the Knicks study said. Contract signings are scheduled to begin on July 8. But the courtship of King James is about much more than winning a basketball championship, bragging rights or the love of the game. “If James played for a team like the woeful New York Knicks or the disastrous New Jersey Nets, the economic impact on the area would be immense. According to the New York City Economic Development Corp. (EDC), each Knicks or Nets playoff game would deliver some $3.6 million to the region. And if you are ready to dream the impossible dream, an NBA title could inject close to $60 million into the local economy,” writer Maccabee Montadon, of Daily Finance on AOL.com noted. The potential financial pull of a James entry prompted major campaigns in Cleveland, New York, Chicago, Miami, New Jersey and Los Angeles. Mr. James would have major impact though the Knicks, who were one of the NBA's worst teams, still sell out Madison Square Garden. When looking at the James economic impact, the EDC considered everything from likely additional customers in restaurants and bars, to increased TV ratings and even the taxes that would be paid on a new home, Mr. Montadan wrote. “Should James opt for the orange and blue, Madison Square Garden would see an estimated $10 million to $20 million revenue surge, according to Patrick Rishe, an economics professor at Webster University. And Forbes magazine estimated that the team's valuation would climb $150 million, to over $700 million,” he added, looking at Mr. James' impact as a Knick. In 1998 Fortune magazine calculated superstar Michael Jordan's economic impact and concluded “The Jordan Effect” was “$10 billion—and counting” from his rookie year in the NBA in 1984. Just to name a few areas where MJ hit hard: Fortune said Mr. Jordan's impact on NBA attendance was estimated to be $165 million, and on the league's television revenues at $366 million. Using other methods, the magazine estimated Jordan's impact on the growth of the NBA's licensed products (“official” caps, shirts, jerseys, etc. ), at $3.1 billion. While Mr. Jordan's finances and Mr. James finances look healthy, too often professional athletes end up broke at the end of their careers and Black America loses a potentially valuable resource for investment—investment that could be good for the athletes and good for the community. “The sports industry is worth $410 billion and it is unfair that Black athletes are largely generating this revenue yet we're only the labor force. Without Black players there would be no games so why should we not work to influence our athletes to marshal their resources to invest in our communities?” asked Attorney Everett Glenn, CEO of the California-based Entertainment and Sports Plus firm. From baller to broke, an epidemic? A report by Sports Illustrated noted that nearly 80 percent of National Football League players are on the verge of bankruptcy two years after they retire. NBA players aren't fairing any better, with 60 percent of its former players ending up broke within five years of retirement. Several Black athletes have squandered millions of dollars due to bad business decisions, divorces, child support payments, uncontrolled lavish spending, overall poor financial planning and lack of personal vision, according to Atty. Glenn. “There are no programs in place to transition them from boys to real men when they go pro so these leagues are able to intoxicate them with fame, quick money and having fun. When you have no vision for your life, you get restless and make foolish decisions,” he said. Former NBA great Scottie Pippen earned an estimated $120 million in salary alone over a 17-year career with the Chicago Bulls. Due to the unsuccessful lawsuits he filed against his former law firm, Mr. Pippen owed U.S.Bankmore than $5 million in principal, interest and attorneys' fees, which he reportedly could not afford. On June 30 of this year, Mr. Pippen left the Cook County courthouse in tears after a jury awarded him $2 million out of the $8.2 million he was seeking in one of those lawsuits against two attorneys at the Chicago law firm Pedersen & Houpt. Mr. Pippen accused them of malpractice in the 2002 purchasing of a Gulfstream II corporate jet which stayed grounded due to a lack of inspection. Mr. Pippen paid $4 million for the jet but later found out it needed $1 million worth of engine repair. “I don't want to really say anything, I'm just exhausted and tired,” Mr. Pippen said, according to a Chicago newspaper, before leaving the courthouse. The Honorable Minister Louis Farrakhan, in a major recent address in Atlanta, pointed out how Black entertainers, celebrities and sports figures have been exploited, dying broke while their managers, often Jewish managers, end up rich. “I have a list of NBA owners. See it's like a plantation; you're just a piece of meat throwing balls in a hoop. … You're a rich slave, you're sharecropping again,” the Minister said. “Before they go to the pros, these men lack the training and preparation to know how to make the right decisions. Most who guide them do not have their best interest at heart so they spend a lot of money because they do not have guidance on how to build wealth,” speaker and author George C. Fraser told The Final Call. Mr. Fraser is the CEO of FraserNet Inc., a global networking movement focused on increasing opportunities, wealth and jobs for Blacks. Despite making a little over $10 million this year as a member of the Knicks and nearly $60 million thus far in his career, Eddy Curry is in serious debt while still shooting the ball. According to an Associated Press report, Mr. Curry defaulted on a $575,000 loan with an 85 percent interest rate and has been ordered by a judge to pay back $1.2 million to Allstar Capital Inc. He lost his $3.7 million home to foreclosure while trying to maintain monthly expenses exceeding a quarter of a million dollars. “These players don't keep in mind that their careers won't last forever. They are made to think that these financial pitfalls will not happen to them so they don't even maintain their checkbooks right,” said Gregory Lee told The Final Call. Mr. Lee is senior assistant sports editor for the Boston Globe and chairs the Sports Task Force for the National Association of Black Journalists.“They may master the playing fields of basketball, football and baseball but they can't seem to master the financial fields,” said Mr. Lee. “They don't know how to pick the right advisors. They allow others to run everything for them so they don't even understand finances, real estate, insurance or even know their own net worth,” said Mr. Glenn. For example, Mr. Glenn cites the plight of former Boston Celtics star Antoine Walker, who earned more than $110 million yet filed for bankruptcy in 2009, one year after retiring from the NBA. Mr. Walker's financial moves reportedly included supporting 70 family and friends, building his mother a 10-bathroom mansion, owning at least two Bentleys and two Mercedes and collecting watches. Mr. Walkeralso must stand trial due to allegedly racking up gambling debts nearing $1 million owed to three different casinos in Las Vegas. Since unpaid markers are considered bad checking writing in Sin City, Mr. Walker could face up to 12 years in prison if convicted. He also still owes $770,000 in restitution, penalties and court fees. “A lot of these young men and women, not just in sports but in entertainment as well, forget that one day they're not going to be on top. Just look at what happened to Antoine Walker, Allen Iverson; I could go on and on. It's a shame that a guy like Antoine can make $110 million and now he's broke,” said Earvin “Magic” Johnson, an NBA great and businessman, in a recent interview with Black Enterprise magazine. Another report by Sport Illustrated stated that some of the the top reasons why athletes go broke include the lure of seemingly good investments, risky ventures, misplaced trust, family matters, and mismanaged generosity with new found friends. According to MSNBC, former NBA player Latrell Sprewell had his Italian yacht seized by a U.S. marshal after his mortgage went into default. Eventually his home, valued at $5.4 million, went into foreclosure in 2008 despite the fact that he made nearly $100 million during his career. The former NBA point guard Kenny Anderson filed for bankruptcy in 2005 after making a estimated $60 million in his career. He managed to accumulate over $40,000 in monthly expenses to go along with child support for eight children, the same number of cars he owned. Financial mismanagement further led to an unmanageable home in Beverly Hills, a $10,000 monthly allowance, and regular $3,000 giveaways to relatives. In his divorce, he lost nearly $6 million in a prenuptial agreement. NFL quarterback Michael Vick went from being on Forbes 100 list, earning up to $130 million, and reportedly being one of the world's richest athletes to later filing bankruptcy, losing two homes and serving jail time for operating an unlawful dog ring. Four-time heavyweight boxing champ Evander Holyfield reportedly made over $250 million during his boxing career, but despite this he reportedly is flat broke also. Mr. Holyfield bought a 54,000 square foot home with 109 rooms valued at $10 million but eventually lost it due to foreclosure. He was also reportedly thousands of dollars behind in child support payments for the 11 children he has fathered. “That system is only interested in their talent, not their development as men. These athletes are not taught any life skills. Many of them come out of poorly guided homes and so they are not nurtured to think about life after the game stops. So they end up broke,” said Mr. Fraser. “We want to help our athletes get rid of these disturbing statistics of by linking them with the best that our people have to offer in the services that they need. Every community recycles their dollars with their own people. We must do the same,” said Mr. Fraser. While Blacks make up only 13 percent of the United States population, Black athletes constitute 80 percent of the players in the NBA, 67 percent of the NFL and 9 percent of MLB. “We need affordable, safe and clean housing. We have schools without books. We have HBCUs struggling to pay their bills. Our people need employment. We need support for programs that will provide our youth with alternatives to violence. Our athletes can help,” said Mr. Glenn. The FAIR initiative is further designed to increase the utilization of Black professionals across all industries. Mr. Lee told The Final Call that the NABJ Sports Task Force is partnering with the player associations from the various leagues this year to conduct forums to address issues such as the financial pitfalls. But he encourages parents to start early. “Everyone wants to try to be the next LeBron or Jordan, but you have a better chance of winning the lottery than making it into professional sports. We need to instill in our children realistic goals and values when it comes to finances, education and careers,” he said.